I’m back! A couple of weeks ago, my friend Keith and took a trip through Southeast Asia, I have so many stories and insights to share over the next few weeks, but for now, a quick rundown of the trip will have to do. I’ve been through Japan and China before, and even India, but somehow Southeast Asia had always eluded me. It’s strange to think about that when I consider that it was Southeast Asia, particularly Vietnam, that I’ve wanted to travel to for nearly two decades. Growing up I vividly recall stories on the news about the treatment of Vietnam vetrans and the problems they were dealing with. I knew that was a controversial war/conflict/subject, but it was a mystery to me. Maybe it was because it was still so raw, but no one ever seemed to actually discuss the war. Then in the late 1990s, I saw a documentary one lazy Sunday afternoon called “Long Time Coming” about a group of Vietnam veterans that returned to Vietnam and traveled across the country in an attempt to make peace with themselves. It’s a terribly moving film, and I still remember thinking that I simply had to get myself to Vietnam. This year was the right time for me to make that journey. Keith and I planned the trip for several months, and we decided on a trip through south Vietnam, from Ho Chi Minh to the Mekong Delta, and then into Cambodia, before moving on to Thailand. It was an amazing trip. It was hot, and dirty, and ancient, and modern, poor and opulent, often all at the same time. I wasn’t entirely sure what to expect as we headed into Vietnam. I have traveled to Communist nations before, and as a rule they do carry about them a bit of a repressive air. Soldiers standing around in public spaces holding very large machine guns tend to make me a bit self-conscious. They also tend to be rather drab in appearance, especially the buildings and the people that came up under the Communist state. I didn’t experience this in Vietnam. 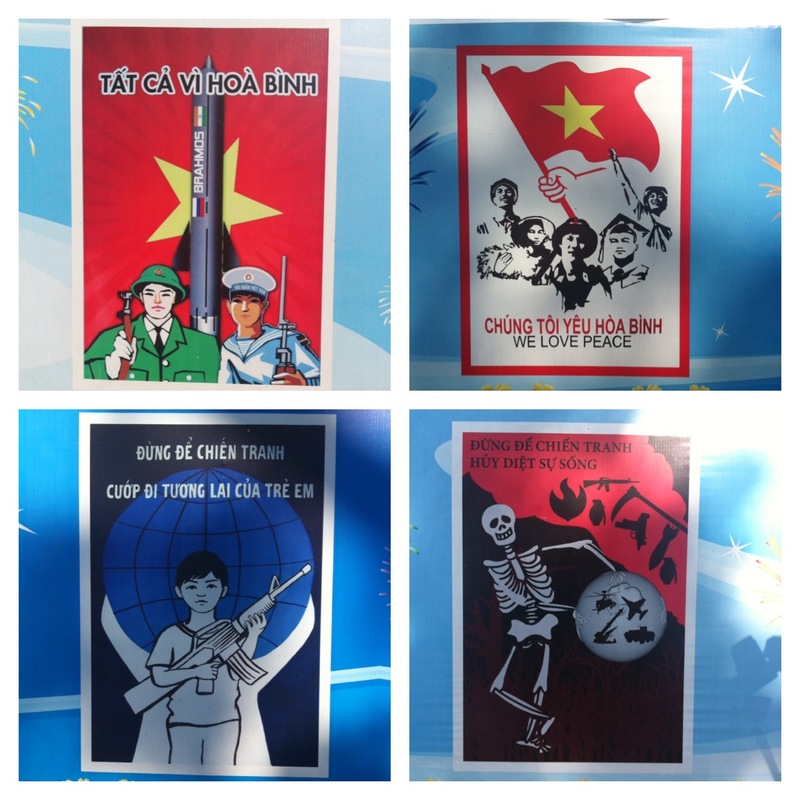 Ho Chi Minh was vibrant and chaotic, and I feel like I only scratched the surface in the time that I was there. 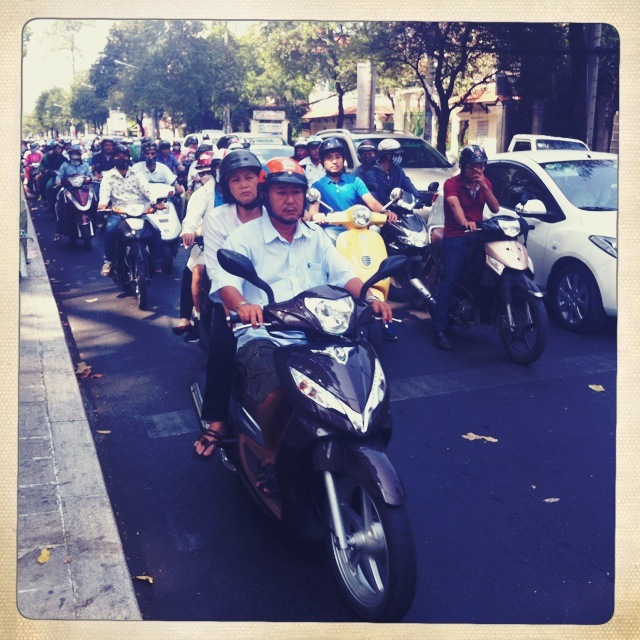 The first thing anyone notices about the city and Vietnam, in general, has to be the traffic. The Vietnamese absolutely love their motorcycles and scooters. Everyone seems to prefer them to cars, and almost no one is troubled by traffic laws. Are you in rush and there’s a red light? No Worries! Simply drive on the sidewalk. Did you miss your turn by two blocks? Turn that bike around and drive into oncoming traffic! When lights change, a flood of two wheeled vehicles pour down the roads. Even the well-heeled scoot around the city and the country in this manner. It was common to see well dressed women in six inch heels jump on their bike and take off. We spent the first day seeing the sights around the city: Notre Dame Cathedral (the largest church the French ever built outside of France), the Post Office (which is colonial in its architecture, and still collects the mail, but is more of a tourist trap today), and the Restoration Palace. Entering the Restoration Palace is taking a step back in time. When the Americans walked away from Vietnam in 1975, the Communist forces took control of Siagon and renamed it Ho Chi Minh. The palace had been the seat of government prior to and during the conflict. Nixon even visited. When the government collapsed and the Americans left, it was from this roof that the last of the U.S. forces departed via helicopters. The building was kept exactly as it was at that time. The carpet is still swag, the furniture is still velour, and everything is either marigold yellow, baby blue, or red. There’s still an American helicopter sitting on the roof, and a Vietcong tank sitting in front of the building. Like most things in this part of the world it’s overcrowded and very hot, but well worth going to see. From here we made our way over the War Museum. It’s run by the government, and contains a substantial amount of propaganda, some of it disturbing, but it tries to tell the story of the Vietnam conflict from the Vietnamese perspective. The imagery was disturbing, as were the U.S. planes and unexploded ammunitions that encircled the building. I thought it was rather ironic that it was here, in the heart of “anti-American” Vietnam that I discovered just how amazing and friendly the Vietnamese are. While purchasing my ticket, I absentmindedly walked away and didn’t get my change. The woman in the ticket booth knocked on the class and shouted at me to come back. Then as we walked in, I passed two policemen on the street. I decided I’d ask them for a picture and they were happy to oblige. They asked where I was from and smiled, and shook my hand when I was done. Time and time again this would be my experience in Vietnam. 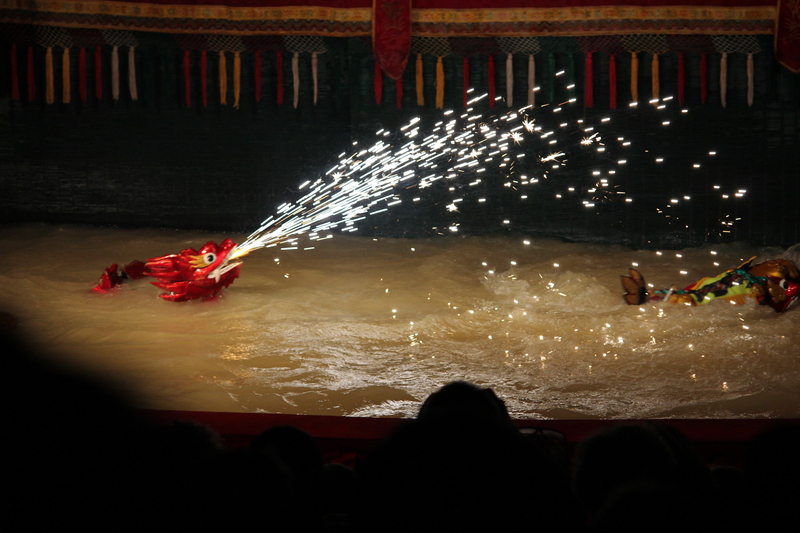 That night we checked out a traditional water puppet show, which is a folk art that originated in the rural areas. 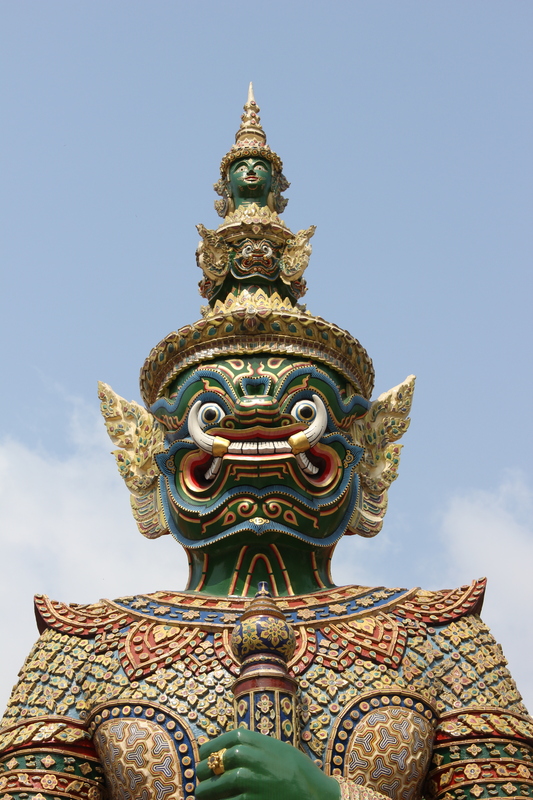 When the rice fields were full of water, puppeteers would use long sticks to control the puppets from under the water. I’ve never seen anything like it before, and it was a nice way to spend 45 minutes. Then we made our way over to the city’s newest and most modern building the AB Tower for a nightcap. It has a striking resemblance to Stark Tower in “The Avengers.” It was sleek and hip, and was a nice contrast to the very traditional puppet show. 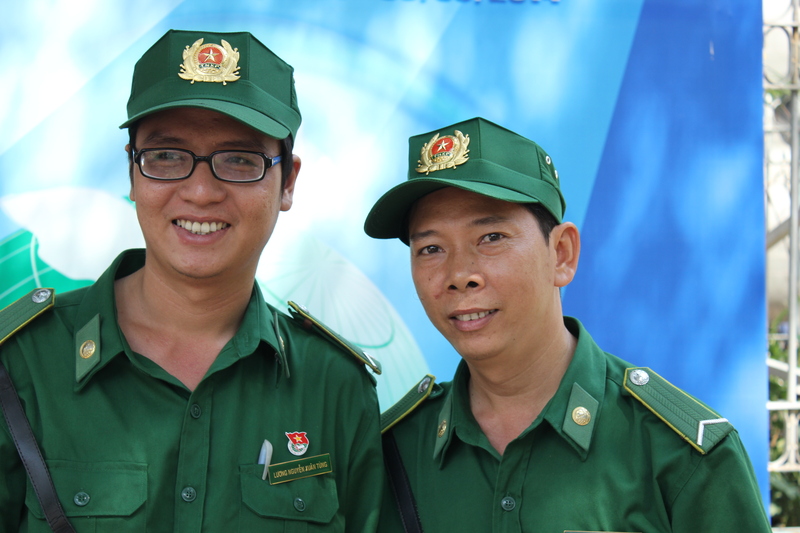 The next day we were picked up by our driver and made our way to the Mekong Delta. We took a tour that included boats across the Mekong River, skiffs up amazingly beautiful fern and palm lined canals, carriage rides, and even a sampling of coconut candy and wine (I can’t recommend either). Lunch was a different story. We had elephant ear fish which is gutted, and then deep fried and served to you on a stand, complete with the head looking straight at you. I’m not a huge fish lover, unless it’s square, and covered in malt vinegar and served with side of fries. I do love sushi, though, but I hadn’t expected this. I swallowed hard and made due, as one simply has to do sometimes. We spent the night in the small town of Can Tho, and explored it a bit, wondering the city’s back roads, peeking into open doors and seeing children watching Tom and Jerry Cartoons and old men avoiding the afternoon sun by sitting in their living rooms in their underwear playing on the internet. 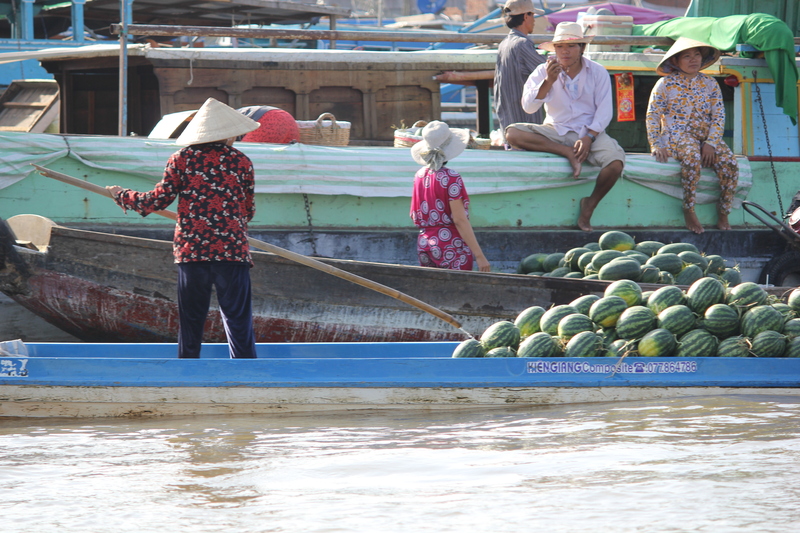 The next morning we jumped on a boat and went up the river a bit to the floating market, where produce of every variety was sold, being passed from boat to boat in a mish mash maze of old boats, shouts, and fruit. We drove back to Ho Chi Minh and hopped our afternoon flight to Cambodia. The first thing I can tell you about Cambodia is that it is cheap. I mean really, really cheap. Each night we had an amazing dinner and drinks, and an appetizer, and it was all roughly $3.00 per person. Its currency is so devalued that the country pretty much runs off of U.S. dollars, so there’s no pesky exchange rates to worry about. Everything was similarly priced. For example, our hotel offered one hour massages for $6.00! We liked it so much the first time we went back on our second day. In fact, the massages were actually much needed. The second thing I can tell you about Cambodia, is that it’s hot – like Alabama in August with no shade and extremely high humidity hot. The nights drop in the eighties, but the days push a hundred degrees. Be prepared for the heat by slathering on the sunscreen. The massages were a nice treat to come home to each night. 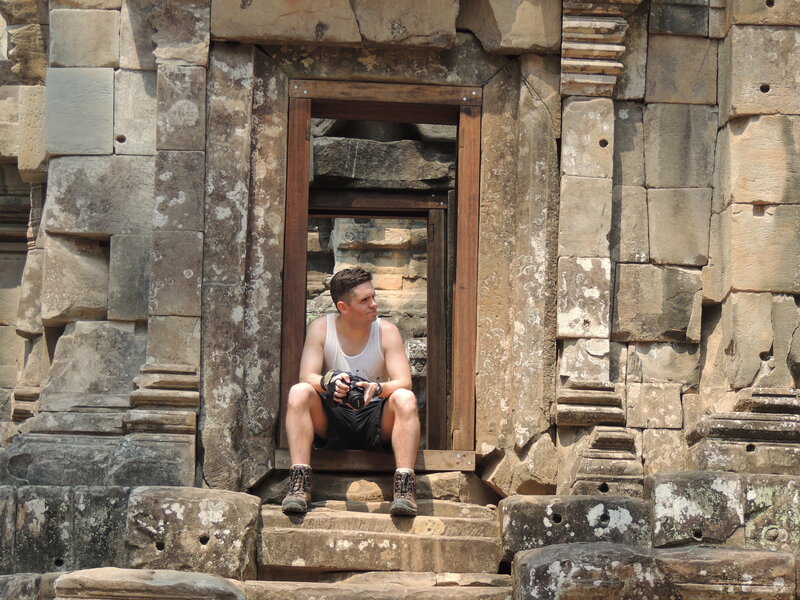 We were in Siem Reap and Angkor for our time there and we explored most of the temple complexes. Although some of the guide books suggest that users rent bicycles and travel from temple to temple, I cannot recommend this. Granted the traffic is actually much calmer (i.e. we saw no one driving on the sidewalks), it is brutally hot, and the few minutes that you can jump into a car with air conditioning and cool off can make a considerable difference in your day. We actually booked a car and driver through our hotel, and he was exactly what we wanted. When I travel, I’m not a huge fan of a guide that walks me from point to point and rambles on about mundane facts. By the time I’m there, I’ve done my homework and my objective now is to explore and take pictures and experience the location. This was exactly what my time in the Angkor temple complex was all about. Keith had set up our route and talked it over with the driver. We traveled from temple to temple, climbing up each one, hiking through those in the jungles, and generally being amazed. Angkor is so much bigger than I imagined it to be. Granted it was the largest metropolitan area in the pre-industrialized world, and it’s the largest religious complex ever built, but I thought it would be more on the scale of Vatican City. I was completely wrong. It’s miles and miles of temples. Some of them are close together, but others are spread out. One is actually on top of a mountain and carved out of the stones surrounding a waterfall. Others are tucked away into the jungle and have been covered up by massive trees. Still others are in the middle of lakes, or in dry arid areas. 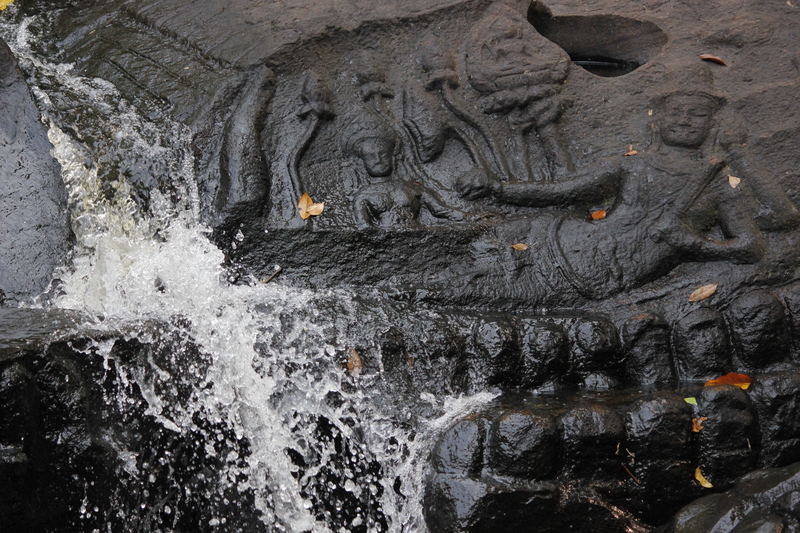 There’s an amazing diversity to the stones that were used and even the carvings and styles show a clear evolution. Our first day was spent exploring the temples that are relatively close together. 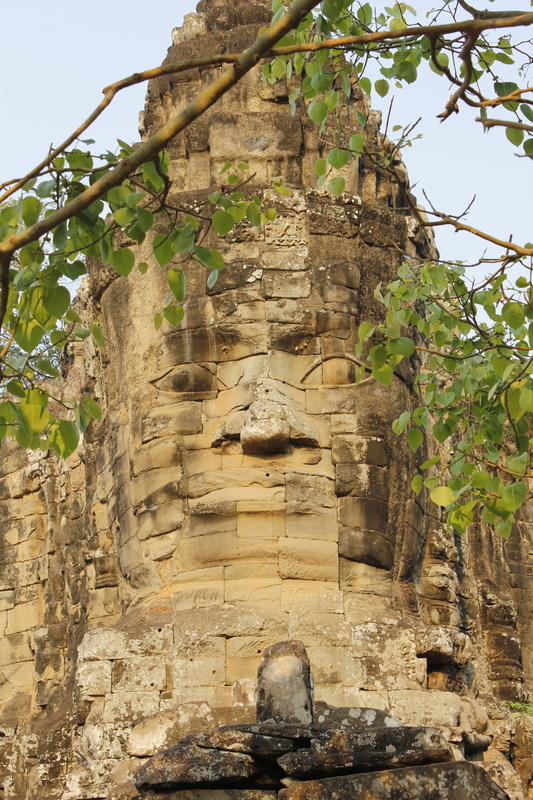 These are the temples that are the most recognizable, such as Angkor Wat. That afternoon we spent some time at a roadside café, and met a woman we called “Sugarcane Mary.” She was the proprietor of the café, and there was nothing particularly special about it. In fact, it was one of many. All of them were little more than a tarpaulin hammered over a bamboo frame with folding tables and plastic chairs underneath. Each one had a woman who would call out “Pineapple Mango!” over and over to the endless stream of tourists that walked by. The cafes were all lined up next to each other, all selling the exact same assortment of cold drinks and hot food made in make shift kitchens. Yet locals kept driving by all of Mary’s rivals to come to her to get a class of sugarcane juice. I was fascinated by this. She would take sugarcane into a press, and after several passes of a single stalk, she would empty out the crude hose attached to the side, and pour the sap over ice with a little water added. I had to try it and it was AMAZING. If I could I would turn Sugarcane Mary’s into the next Starbuck’s. Seriously. That good. Check out the video of Mary hard at work. When then hiked up a mountain to watch the sun set, which was bit of bust. 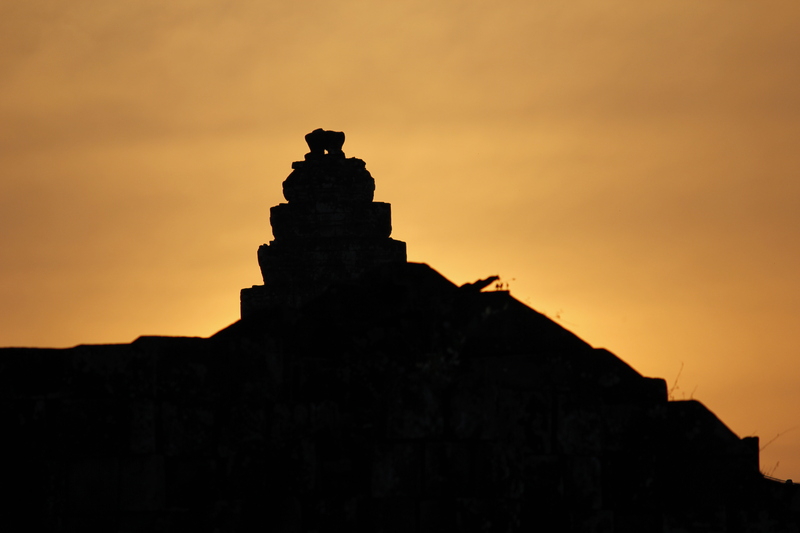 Because of the heat and haze, there really wasn’t much of sunset, but I did get some nice silhouetted pictures of a temple. 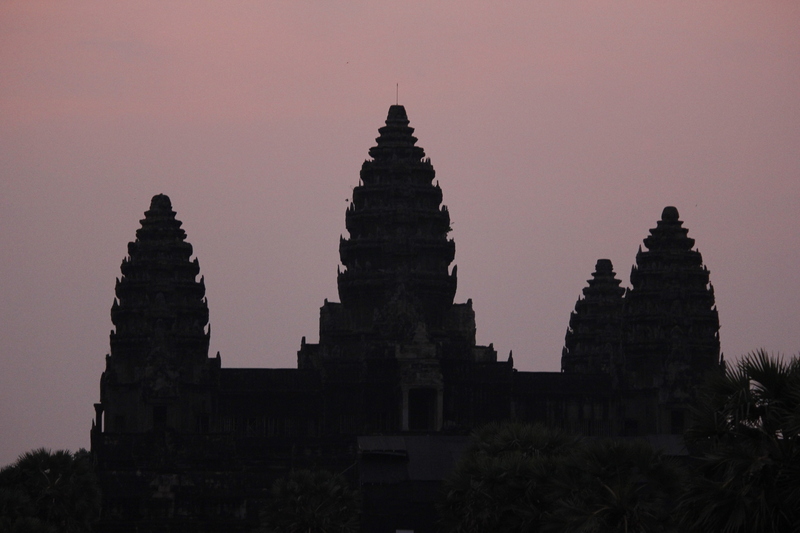 The next morning, we woke up early to get pictures of sunrise at Angkor Wat, and again things didn’t work out. Basically, it was night and then…..it was day. We traveled through a very rural area and hiked a couple of miles up the side of mountain to see the waterfall temple, and it was brutal to get to the top. For entertainment we were lucky to have a dog that belonged to one of the guards (I think) that kept us company all the way to the top, and we named him “Lucky.” [Lucky shows up in one of the videos at the bottom of this post.] I was really glad that we decided to make the climb in the blazing heat because this was the only temple that retained it’s original Hindu carvings. Angkor was built as a Hindu complex, but converted back and forth between Hinduism and Buddhism for centuries before finally settling into Buddhism for the last couple of hundred years. A few more temples followed and then we moved on to the land mine museum. It’s a small museum in the middle of no where, but it was interesting to learn a bit more about the troubles in Cambodia in the late 1970s and early 1980s and the devastation that mines have and continue to cause as civilians step on them. At each of the main temples that we visited I was reminded of this. Many of them had a small traditional band playing at the entrance. They were selling CD’s and asking for donations. Most of the band members were missing legs or arms or had been blinded or mangled in someway due to the thousands of land mines left behind by the Khmer Rouge. Even with all of the hardships of the past, I definitely got the feeling that something big was going on in Cambodia. 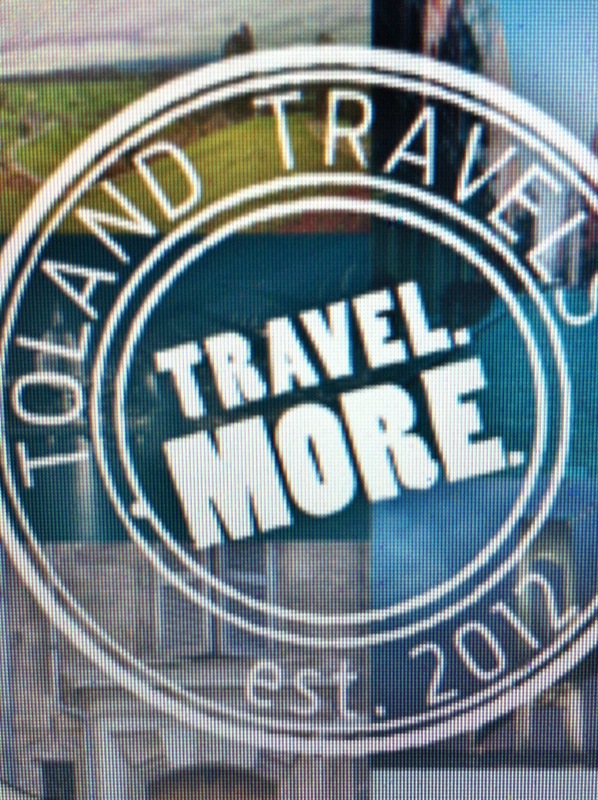 It’s almost on the edge of becoming THE next big travel destination. Luxury hotels were popping up and Angkor was flooded with tourists, and I think that for the nation, those are very promising signs. This was a conversation that I had with merchants everywhere in Bangkok. I can honestly say that I have never traveled to a country were I was so harassed about buying things. People regularly approached us on the street offering us “information” and “tours.” These were all lies by people trying to get us to alter our route to get us into a place of business of some sort. 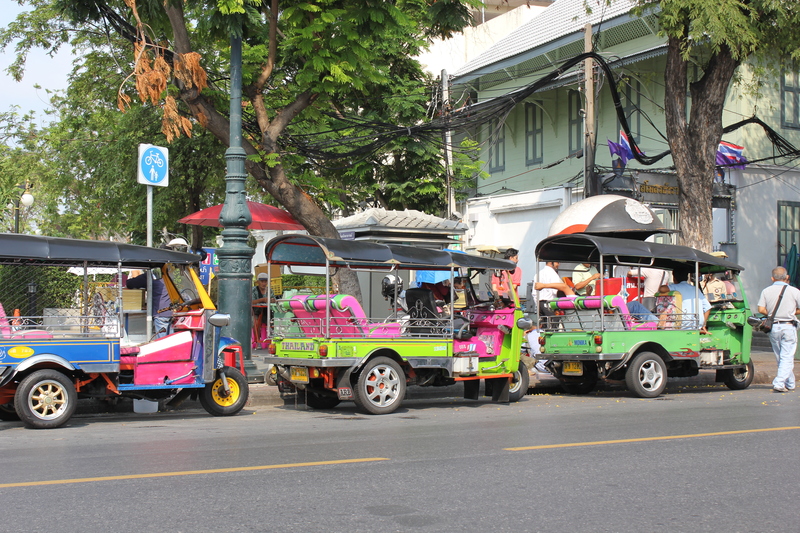 This way of operating is the norm in Bangkok. At every attraction we visited signs were posted, warning tourists about these scams. Even the tuk-tuk drivers were trying to rip us off. When we would tell one where we wanted to go, they would respond with “Why you go there?” It became such a hassle that we would simply walk away. We learned that if we flagged one down a block or so from a tourist attraction we tended to get a better price and no attitude. One morning we got a tuk-tuk to take us to the public dock so that we could catch a water taxi, and the driver lied to us and took us to a random boat tour company, and then when we told him to take us to the place WE wanted to go, he became angry at us! It was unbelievable. 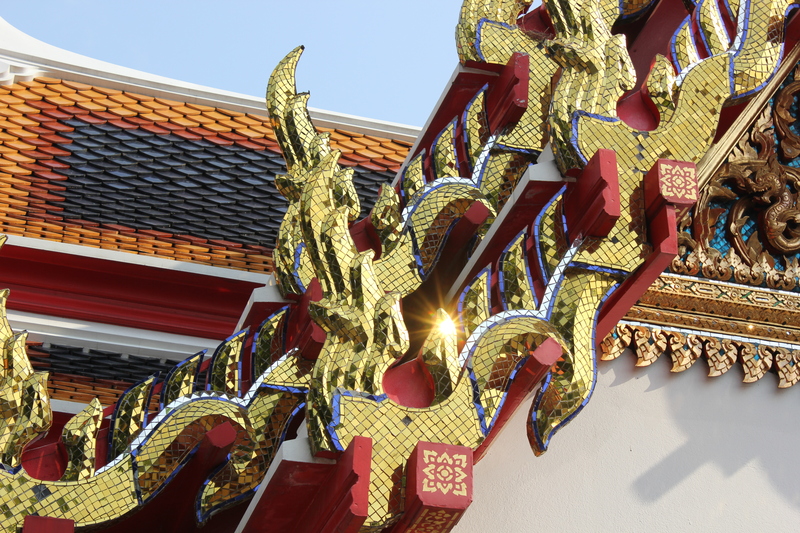 When it wasn’t trying to rip us off, Bangkok does have beauty that shines through. The Royal Palace is simply unlike anything I’ve ever seen before. It’s one part opulence, one part fevered dream, and one part mirrored disco ball. 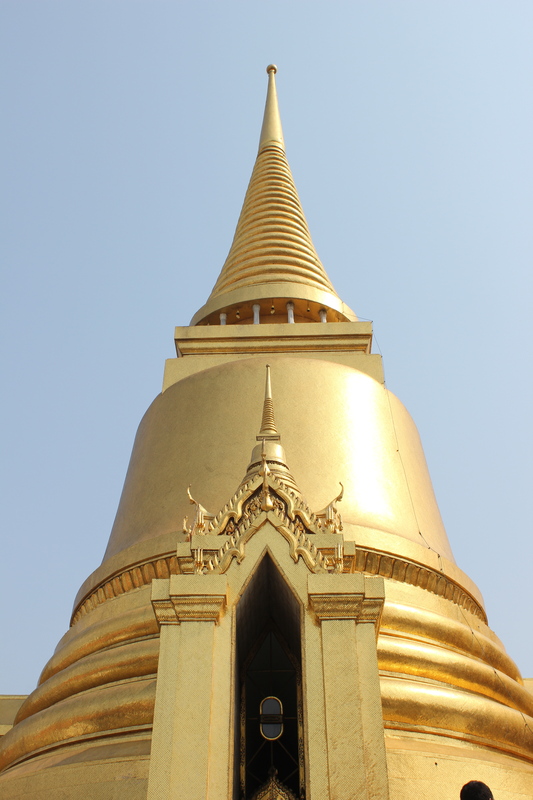 It’s got gold buildings, a Buddha made from a giant emerald, and every building is covered with tiny pieces of porcelain and reflective glass. The temples are also amazing! Golden Buddhas, sleeping Buddhas, laughing Buddhas, they’re all there and each one is different and worth seeking out. Something I found a bit disappointing was Bangkok’s legendary nightlife. We visited Patpong, and it seemed to me to be like a low rent Bourbon Street, and even that has it sad qualities to me. It was mostly a bunch of runty looking men tring to lure tourist into seedy bars to rip them off and scantily clad women standing on sidewalks tying not to look desperately bored. Overall the trip really was amazing, and I’m happy that I got to go and that I was able to spend time with an old friend. Any adjective that I can think of, good and bad, applies to southeast Asia. Yet, it’s hard to think of one that really does the region justice. Check out the video below for a few more of my thoughts on the trip, and YES!, you get to hear some of Keith’s thoughts, too!